Alan is an Elder in the Alabama-West Florida Conference of The United Methodist Church. In pastoral ministry since 1993, he graduated from Asbury College in 1998 with a BA in History and English. His Master of Divinity is from Asbury Theological Seminary, 1993. 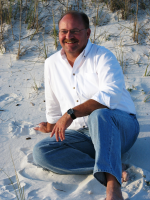 Alan received his Doctorate of Ministry from Beeson Divinity School, Samford University in 2006. He was born in Pensacola, Florida. Alan is married to Karen Dougherty McBride of Jennings, Louisiana. They married in her home church July 1, 1989. The McBrides have three teenage children, Will, Laura, and Allison. Alan has served several United Methodist churches in Alabama as Senior Minister and has been at Orange Beach United Methodist Church since 2007. In pastoral ministry for 21 years, Alan has conducted hundreds of weddings in many different settings including dozens of gulfside beach weddings.